Unexpected technical and logistical difficulties arising around the November visit of Julio Iglesias, have resulted in the cancellation of the New Zealand tour. The promoters and artists’ representatives have reluctantly mutually agreed to the cancellation this morning. Two NZ shows were scheduled: Auckland November 18th and Christchurch November 22nd. Patrons will receive full refunds from the booking offices, Ticketek (Christchurch) and Ticketmaster (Auckland). Julio Iglesias, the internationally acclaimed, Grammy Award-winning Spanish singer, songwriter makes his long-awaited return to New Zealand for a concert in Auckland in November on his Greatest Hits Tour. A passionate balladeer with unmistakably silky tones whose music is known for its celebration of love, peace, and humanity, Iglesias is one of the best-selling male artists of all time and the most successful Latin artist in history. Over nearly 5 decades he has recorded over 80 top-selling albums in 14 languages, many multiple gold and platinum certified, with worldwide sales of over 300 million. Among his best-known melodic and sentimental hit songs from the height of his career in the 1980’s and 90’s are Hey, Feelings, Moonlight Lady, Me Va Me Va, Amor, Non Stop, Starry Night, Calor, and Crazy, a number from the hugely successful Hey and 1110 Bel Air Place albums released in 1980 and 1984. His duets with Willie Nelson ("To All the Girls I've Loved Before"), Diana Ross ("All of You"), and Steve Wonder ("My Love”) all topped the charts. Ironically, Iglesias’ first steps towards stardom were on the football field as a goalkeeper for Real Madrid, but after being paralyzed in a serious car-accident at the age of 20 closing the door on his promising sporting career, Iglesias turned to music while regaining his mobility over the course of three years, learning to play guitar and developing his songwriting skills. In 1968 he won a songwriting contest that led to his first recording contract. The following year he released his debut album “Yo Canto” in Spain and in 1970 hit the world stage with a high ranked performance in the Eurovision Song Contest. By 1971 he’d sold his first million albums and begun to expand his fan base throughout the Spanish and English speaking world. Beautifully crafted and delivered songs mixed with Latin good looks and charm soon had Julio on the path to his stellar, long lived musical career. 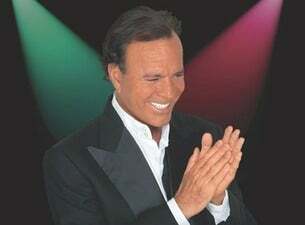 Still one of the world’s most successful touring artists, and the best-selling Latin artist of all time, Julio Iglesias has especially asked to come to New Zealand to perform his greatest hits in a spectacular concert accompanied by a superb cast of 10 musicians, singers and dancers from across Europe. Enjoy a magical evening with a Latin legend.